Posted by ayasawada in Film, Music. The Documentary of AKB48 films are really special to me. Bearing the production backing of indie director Shinji Iwai and given unparallelled access behind-the-scenes of the AKB machine, it’s fascinating and gripping stuff for anyone intrigued by the circus. Given that these films are also somewhat responsible for me becoming an AKB fan, I’ve been looking forward to this latest one for months. So was it worth the wait? Hell yeah. Aesthetically, the film is a marvel. They must have had reams of rushes from following the girls around as they seem to have had cameras everywhere grabbing everything from beautiful backstage panning shots to intimate hugs and breakdowns in what the members must have assumed were ‘quiet corners’. The quality, matched by an excellent structure and theme make for a top documentary I couldn’t take my eyes off. No flower without rain builds on the drama of the second documentary, Show must go on, following the group as they deal with the change enforced by the departure of their shining star, Acchan (Atsuko Maeda). Indeed, departures is the theme of the film and what’s interesting is how the filmmakers focus a lot on the drama, choices and shockwaves that occur as the number of scandals surrounding members spirals. The subtitle of the film is “少女たちは涙の後に何を見る” (what will the girls see after the tears?) and that should alert you to what’s in store. There’s a lot of crying. Probably 60% of the film is crying. There were a lot of tears in the previous film, but boy does this one top it. Girls crying because their best friends are leaving, girls crying because their teams – and hence their close friendship groups – are being broken up, girls crying because their future has been ripped to shreds by tabloid journalists. It’s heartbreaking. Over the course of the film there are a lot of revelations and foreshadowing, particularly watching this a week after the 2013 AKB General Election. Mariko Shinoda looks sad right from the beginning and her words seem to foreshadow her recent graduation announcement. Similarly, Tomomi Itano drops a bomb during one of the 1to1 documentary interviews: “When is this footage going to air?” she asks, and, on being told that the release date is February 2013, she reveals that by the time people see this she too will have announced her intention to graduate from AKB. Minami Minegishi (disclosure: my oshimen) appears philosophical, saying “It can’t be helped” when asked about scandals and no-dating (Mi-chan of course infamously shaved her head and appeared on YouTube, begging to stay in AKB – the incident went viral and made mainstream news all over the world). Then there’s the real phoenix from the flames story. We see Rino Sashihara all smiles at the 2012 General Election, only to have them torn down when her own scandal erupts and she’s transferred to HKT48. Watching her come to terms with events and the speed of change, and eventually settling and really leading HKT is pretty moving, but we know that the real happy end isn’t in the film. Real life went beyond happy end a fortnight ago when Sashi incredibly ranked No. 1 in the 2013 General Election. It’s poignant to watch this documentary now, with the announcer’s words in the 2012 election (“A miracle has occurred. The hetare girl from Oita has finished in the Top 4”) foreshadowing the even greater miracle a year later. Sashihara’s story encapsulates a lot of the themes of the film. We see many other members dealing with their own scandals, many choosing to do the honorable thing and quit. We see as other members react to the consequences of the scandals – HKT48 members are initially worried what Sashihara’s arrival will mean for their own prospects. And we see how in the midst of one inevitably feeling sorry for oneself as life takes a cruel turn, the support and friendships of their friends in the group help to pull them through. The hard work ethic of AKB also plays a part, and it’s interesting to see the management team shedding tears as the girls they look after go through hell due to the rules and environment. But then this is what gave them all their fame and the rules are transparent. As I’ve previously pondered, knowing what you’ve signed up for and actually giving up part of your humanity for it are two different things and that contrast is fascinating. For me, only Minami Takahashi, the AKB Groups’ leader, seems totally able to deal with this. Sure she’s drunk the AKB gatorade, but she understands the AKB ethic while many of us still struggle with it. Team 4 breaking up was heartbreaking! Jo-chan, the former NMB48 member who joined as a massive fan of Acchan. The moment where she cries on Acchan’s shoulder after Acchan’s graduation announcement is just… wow. The six original generation members performing ‘Party Hajimaru yo!’ to open Tokyo Dome – the documentary revealing that that was the song they sang to open the first ever AKB performance, to a near empty theatre. Understanding a little more about the overseas transfers. Sae Miyazawa wishing to ‘expand her horizons’ upon realising there was a hefty queue of more popular members in front of her made a lot of sense. And seeing Aki Takajo distraught after just missing out on the senbatsu in the 2012 election (after the management cut the senbatsu from 21 members to just 16 – Takajo ranked 17), then turning that into action by grasping the chance to start again by moving to Indonesia and JKT48. Acchan’s final rendition of Sakura no hanabiratachi – a cheesy choice director, but nicely played and very moving. For me, this doc really encapsulates well my first year as an AKB fan. Acchan’s graduation is one of my earliest memories as an AKB fan, her graduation gig at the AKB theatre my first AKB ‘live’ (streamed on YouTube). What I’ve liked about these last 2 documentaries in the series is that they really seem to move the story on. If your only familiarity with AKB was through these documentaries I think you’d still get a good idea of what this world is about and a fabulous story. If To be continued introduced the AKB universe and its major stars, their hopes and dreams, and Show must go on saw those dreams tested in the harsh realities of life. 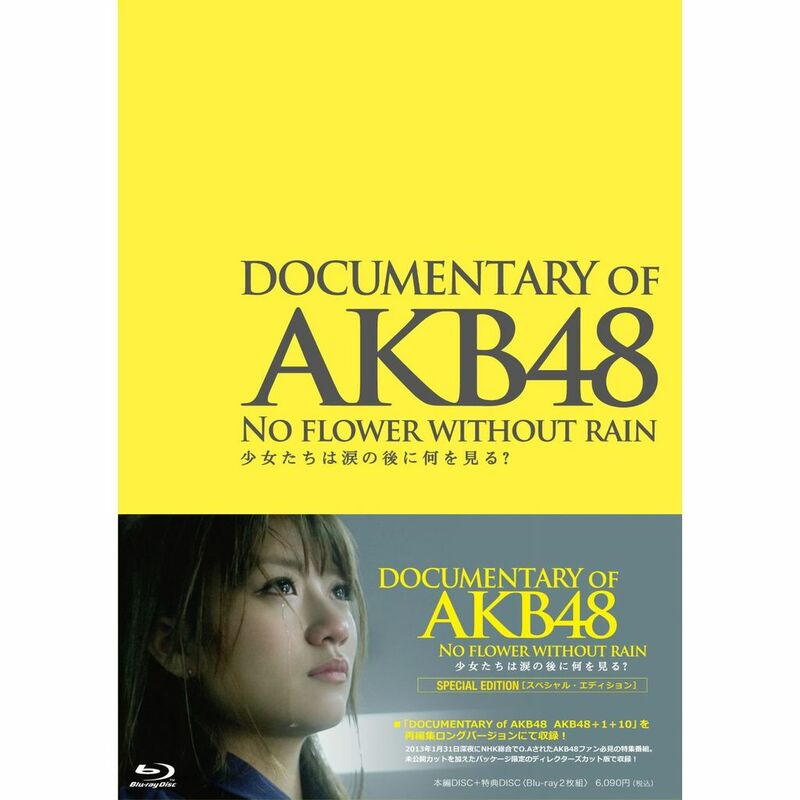 No flower without rain forms a nice bookend to the trilogy – the tale of many of those original generation stars leaving, AKB having given them a platform from which to launch into their dreams. This third film asks, What’s the future of AKB? Can it survive without Acchan? Indeed, can it survive as more and more of the popular members graduate, scandal after scandal occurs and more and more members realise the limitations of what they can achieve within the confines of the AKB system? The last quarter of the film points to the members who are ‘stepping up’ and competing for Acchan’s place – Yuko Oshima remains most popular, practically by default as Acchan’s closest rival; Mayu Watanabe strives to keep up, but still struggles to make that final step (indeed, Mayuyu doesn’t get a lot of focus in this film); and the newer members such as new darling Haruka Shimazaki openly state their ambition. Yuko would seem to be in prime position, but as this year’s election has shown, that spotlight is very much up for grabs. The future of AKB is uncertain, but there is a future. I would never have imagined groups like Morning Musume would still be going 10 years later and with AKB in their 7th year, and the Akimoto empire expanding, I wouldn’t be surprised if it lasted many more years yet, particularly in Japan where idol groups seem to enjoy a longevity unheard of in the rest of the world. The film opens and closes with a thought on the loneliness of the center – pressure heaped upon that one person on whom all attention is lavished. It’s what Acchan achieved whether she meant to or not and what ultimately led her to want to graduate, to get away from that pressure, that spotlight. The film emphasises that conflict, how everyone is striving for that position, but when they get it they find that support, that camaraderie they so valued as a regular member, is diminished and they must forge on alone – which inevitably leads to their leaving. And from the top, the only direction is out into the stars. You can currently watch the whole film, with English subs, streamed in 6 parts on Vid48.